The Urb.Energy project deals on the one hand with energy efficiency in the building sector and on the other with the aspect of urban development. Energy efficiency in the building sector is one very important issue when it comes to the goal of saving energy and CO2. Additionally relevant is that proper renovations give more comfort to the users. The cosiness in an energy efficient refurbished house is much higher than before. In one of the next newsletters we will examine the financing mechanisms of urban development measures. This article is about the challenge of financing energy saving measures. When it comes to a cost estimate in the planning stadium of a building refurbishment one will see that in most cases energy efficient measures are more expensive than standard measures. Often the house owners don’t have the needed capital. So they have to take a loan to afford those requirements. Those loans often are not suitable for this kind of financing. The loan term might be very short and the interest rate too high, so that the monthly burden is prohibitive. Even if the energy consumption of an energy efficient house is lower than before, the savings might not be sufficient to cover the financing costs of the building measures. In some cases grants might be distributed for those purposes, but often the available capital is not sufficient for a wide range of building measures. The number of investors that benefit from those grants is limited and once a grant is paid out the money will not be available any more. So the conclusions often are the wrong ones: no measures or only the realisation of standard measures. To motivate people to do the right thing and realize energy efficient refurbishment one way can be to provide financial instruments that cause acceptable costs and may even turn the building measure into a profitable solution. For that goal one needs a range of suitable and sustainable financing instruments. One of those instruments is the model of the revolving fund, which is a combination of loans from the capital market and grants. This fund can be distributed as interest reduced loans for abovementioned measures. The policy should be: the more efficiency the better the conditions. Further suitable financing mechanisms for those kinds of projects are the Energy Supply and the Energy Performance Contracting. 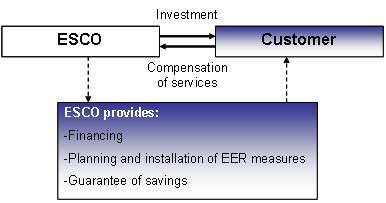 In these models Energy Service Companies (ESCOs) provide financing, planning and guarantees of savings to the customer. The customer also gets the energy supply from the ESCO. This is a save and comfortable option for the building owner to realize energy efficient measures for predictable costs and low risks.